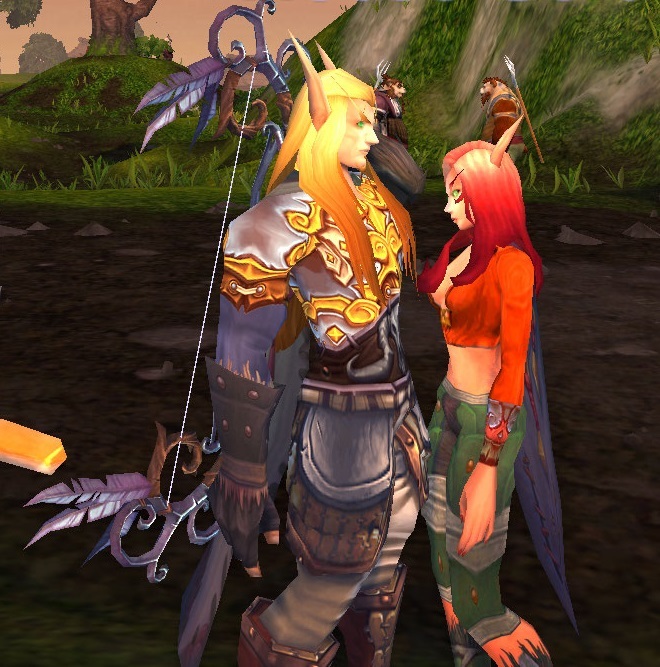 Fnar meeting his lady in Halfhill for a moments respite from the adventures in Pandraria. These two should have many adventures in the future together. This entry was posted in Fnar Dawnglory, Winds of War and tagged Blood Elves, Fnar Dawnglory, Fun Times, Home, More Adventures To Come, Pandaria, Romy, World of Warcraft. Bookmark the permalink. D’awww.. these two are soo fun together.. Romy totally adores him,and you’re right ,these two should definitely have alot of adventures together. I’m glad you liked the picture – it took some serious cropping to eliminate the in-game guild names and character names – Yep, they are really heading into some fun times in the very near future, I’m thinking. They RP great together and are very much alike in temperament. He is NOT dressed to impress. Other colors would do him more justice! He must get a new wardrobe, stat. Transmog adventures? YES I THINK SO. Yes, indeed. I have several 90s running around and he happens to be on the “B” team for right now. Yes, I will be doing some runs to make sure that he is properly attired before he makes his next “live” appearance. Hehe, I thought about throwing him into some of his HoT gear that he has in the bank, however, this was kind of an impromptu RP session that caught me off-guard and I’m just learning how to utilize the screenshot features on WordPress. I promise he will look better next time.